The Ring of Kerry drive is one that I’ve been doing since I was a kid, when we used to go on holidays to Cork and Kerry. Holidays where it was rarely sunny and the rain regularly poured ferociously. Over the years, as I started to explore more and more of Kerry, I realised that those that drive the ‘official’ Ring of Kerry route and follow it to a tee miss out on a tonne of spectacular attractions. Many of which are just minutes from the main route. So… we’ve mixed it up a little to ensure that you experience an unforgettable road trip that takes in as much as physically possible over the course of your visit. Stuck for time? Bookmark this page or jump to one of the sections below! A favourite amongst tourists and arguably one of the best things to do in Kerry, this picturesque loop takes you to wild, rugged islands, along gorgeous sandy beaches, through dramatic mountain passes and puts you in the centre of some of the most scenic parts of Ireland. If you just drove the ring (not what we’ll be doing – keep reading), you could complete it in between 3 to 4 hours, but you wouldn’t get to soak up the best of what it has to offer. In our guide below, you’ll find loads of things to do, the route to follow, a map, info for cyclists and lots more. Have a question about this road trip? Ask me in the comments section at the end of this guide and I’ll get back to you! Here’s a very quick taste of some of the places that you’ll be visiting over the day. This map roughly outlines the route that we’ll be taking on this road trip. Kick start your Ring of Kerry drive from Killarney town. You’ll be driving anti-clockwise round the Ring of Kerry (this minimises traffic problems on the narrower sections of road). The drive officially ends in Killarney, but I’m going to recommend that you finish in Kenmare and spend the night there instead. OK – let’s get cracking. Below you’ll find a full guide on the best places to see as you spin along the ring. You can do them all, if you like, or chop and change wherever you feel it’s necessary. You’ll find Torc Waterfall a handy 7 kilometres from Killarney Town. You can park the car here (note: this car park gets crazy at certain points of the day, and it’s pretty small) and take the short 200 metre stroll to the waterfall. Sip your coffee, soak up the music of the water crashing and bask in the knowledge that you’ve another two days of exploring Kerry to go. Top tip: Arrive to Torc Waterfall as early as you can. There’s a tiny little carpark here that’s an absolute nightmare to get parking in. When you finish up at Torc, aim your car in the direction of Killarney National Park. There’s a big car park there around near Ross Castle where you can park it up for a while. You’ll find Killarney Park south and west of the town of Killarney, enveloped by rugged mountains, like the McGillycuddy’s Reeks, the highest mountain range in Ireland. Nestled at the foot of these mountains are the magnificent lakes of Killarney. It’s here, where the mountains meet the lakes shores, that lies the 26,000 acres of Killarney National Park. A visit to Killarney National Park regularly tops the lists as one of the best things to do in Kerry. Why? Well, it has a little something for everyone. For the history buffs: you have the chance to dive into the past of Ross Castle and Muckross House. OK, so I’m going to say something that’ll likely anger a fair few people. Every time I see Muckross House top a list of the best things to do on the Ring of Kerry drive, it irritates me greatly. Bare with me a minute. Regardless of whether you’re driving or cycling the route, it’s all about the scenery. You’re in one of the most scenic corners of the country. To say something man-made is the best thing to check out on the route is madness, in my opinion. That being said, Muckross House and Gardens is well worth a visit. This nineteenth century Victorian mansion is set against the stunning beauty of Killarney National Park, and is just a stones throw from the shores of Muckross Lake. Muckross House was designed by William Burn, the well-known Scottish architect, for Henry Arthur Herbert and his wife. Building began in 1839 and was finished in 1843. If it tickles your fancy, you can do a tour of the house and the gardens. Ross Castle is a typical example of the stronghold of an Irish Chieftain during the Middle Ages. It’s located inside Killarney National Park, so it’s a handy journey from stop 2. Although the date of when the castle was founded is unknown, it’s thought that it was built in the late 15th century by one of the O’Donoghue Ross chieftains. Head off on the guided tour. It takes 40 minutes and it’ll give you an insight into the castles history. You’ll find Kate Kearney’s Cottage nestled at the entrance to the Gap of Dunloe (the next stop on our Ring of Kerry drive). Kate’s is a 150 year old family-run establishment where visitors can enjoy the tradition of hospitality made famous by the legendary Kate herself. Originally a síbín (an unlicensed premises that sold alcohol) where Kate distilled her famous poitín, ‘Kate Kearney’s Mountain Dew’, the premises is now a cafe, restaurant and pub. Head in for a coffee. After you’ve fuelled up in Kates, it’s time to head for a ramble in the Gap of Dunloe. In our guide to 48 hours in Kerry, we recommend driving the Gap of Dunloe, as you’ll arrive pre 7am when it’s OK to do so. It’s perfectly legal to drive the Gap of Dunloe, but it’s recommend that you avoid doing so during peak hours, as it’ll be packed with walkers, cyclists and Jaunting Cars. The Gap of Dunloe was formed around two million years ago when Killarney’s ice age took hold, lasting until around 10,000BC. As the snow and ice was steadily pushed northward through the Killarney Valley, it gave the mountains their distinct, jagged appearance, forming what we now know as the Gap of Dunloe. This is a solid option for those of you driving the Ring of Kerry with some time on your hands. When you leave the Gap of Dunloe, aim the car in the direction of Rossbeigh Beach Car Park – the starting point for the Rossbeigh Hill Loop Walk. If you’re stuck for time, just head for a little ramble in the area. You’ll find this beach in Kells, an old picturesque fishing village that’s halfway between Glenbeigh and Cahersiveen. This Blue Flag beach (often referred to as ‘Kells Bay’) is small, sheltered and there’s plenty of rock pools if you’re driving the Ring of Kerry with the kids. Well worth jumping out of the car for a stroll. The town of Cahersiveen lies at the foot of the Beentee Mountain on the Fertha River. In the past, I’ve been guilty of just passing through Cahersiveen, or stopping for petrol and a coffee, but there are ample adventure opportunities here for those with a bit of time. if you’re stuck for time to explore, you can still check out some of what the town has to offer. Head to Ballycarbery Castle first. Ballycarbery Castle was once home to the McCarthy Clan and is thought to have been built sometime in the 15th century. It’s arguably one of the the largest and most impressive castles built on the Iveragh peninsula. If you have some more time (3-4 hours) the Beentee Loop Walk is well worth doing. Here’s a detailed guide for those of you that fancy giving it a crack. Note, above average levels of fitness is required for this one, according to the guide linked to above. Note that some of the following attractions aren’t actually part of the ‘official’ Ring of Kerry drive route, but they’re too good to miss when you’re in the area. I’ve tried on a number of occasions to take a tour to the Skellig Islands, but due to weather, insane bookings and a couple of other factors, I’ve never made it. There are a number of different tour providers that offer a trip to or around the Skellig Islands, but be warned – you need to BOOK IN ADVANCE. And even if you do book in advance, there’s still a chance that the tour will be cancelled due to bad weather conditions. If you’ve been following this website for a while, you’ll know that Valentia Island is one of my favourite places to visit in Ireland. Especially at sunrise or sunset. Here’s a guide, and a tonne of photos, to Valentia Island – visit it, it’s deadly! When you arrive on the island, head up to the car park near Bray Head. For those of you that fancy stretching the legs, you can do the Bray Head Loop Walk which offers brilliant views out towards the Skellig Islands. When you’re done here, make your way up to the Geokaun Mountain and Cliffs (€5 entry fee), and start the steep ascent towards one of the best views on the Ring of Kerry drive. The view you’ll be treated to here is special. Chill on the grass just in front of the parking area or head for a walk. When people hear the words ‘Ireland’ and ‘Cliffs’ in the one sentence, they generally think of Moher. However, there are several other great cliffs to visit across Ireland. One of which is the Kerry Cliffs. Make sure you don’t miss it on your road trip. It’s said that Coomanaspig Pass is one of the highest places in Ireland that you can reach by car. I never knew this place existed until I randomly ended up here a few years ago. If you approach from the Kerry Cliffs, you’ll climb a steep hill. It’s at the top of this hill that you can pull in and admire the view that lays as in front of you. 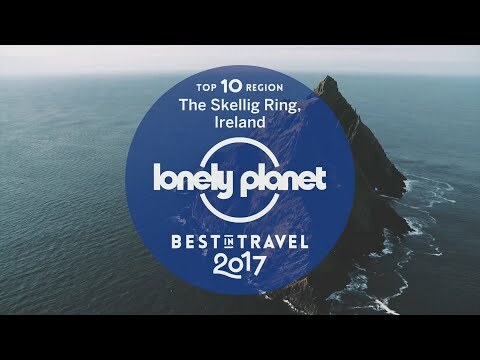 If you’re visiting Kerry, you need to add a spin along the Skellig Ring to your list. it. Is. Deadly (slang for great). The Skellig Ring is is one of the best coastal drives in Ireland. It’s an extension of the Ring of Kerry drive and it’s as spectacular and as scenic as they come. For those of you that add this on to your road trip, expect an unspoiled peninsula with windy roads, gorgeous towns and a backdrop of mountains and islands that’ll make you want to stop the car (or bike) at every turn. This route takes you down narrow lanes, through tiny villages and up steep and narrow cliff roads, wind-buffeted above crashing seas. Please do this. It’s brilliant. But be careful, drive slow and only stop when safe to do so. It’s a great place for a stroll, a bite to eat and a pint, if you’re spending the night or have a designated driver. For those of you that are hungry or in need of a coffee, nip into An Corcan (the steak sandwich is cracking). Interestingly enough, Waterville was a favourite holiday spot of Charlie Chaplin. He and and his family first visited the town in 1959 and came back every year for over ten years. You’ll see a statue of him in the centre of the village in his memory. You’ll find Derrynane Beach just two miles north of Caherdaniel (our next stop) on the Ring of Kerry. The minute you step out of the car and start to soak up the view, you’ll understand why so many people recommended adding it to your Ireland itinerary. A great little spot to kick-back and clear the head. Surrounded by rugged mountains and the sandy shores of Derrynane, the village of Caherdaniel is a town that boasts character and scenery by the bucket load. You’ll find Derrynane National Park close to the village, covering an impressive 300 acres of forest. It’s here that you’ll find Derrynane House, once the residence of Irish patriot Daniel O’Connell, who won Catholic representation in Parliament in 1829. If history isn’t your thing, you’ll also find plenty to explore in the park, from natural rock pools and sandy coves to diverse landscape that offers ample walking and hiking trails. When you’re driving the Ring of Kerry, you’ll encounter a seemingly endless number of quaint little villages and towns. One of my personal favourites is Sneem on Kerry’s Iveragh Peninsula. The views that unravel in front of you as you enter Sneem are worth the visit alone. Expect rolling mountains that appear to fold in upon you from every angle as you enter the village. A great little spot for a bite to eat. We’re quickly approaching the end of our Ring of Kerry drive but don’t worry, we’ll be rounding it off with several bangs. Moll’s Gap is a bendy pass that offers spectacular views of the Macgillycuddy’s Reeks and the surrounding area. It earned its name from Moll Kissane who ran a Sibin (an unlicensed pub) in the area during the construction of the original Kenmare Killarney road in the 1820s. She was well liked in the area. Possibly due to the fact that she sold homemade poitin and whiskey to the men working on the road. Chill here for a bit and admire the view. Ladies View is one of those places that knocks you a little. If you visit in the winter, like we did in the photo above, you’ll find the area a fine shade of yellow and orange. The view here is just incredible. If you’re feeling peckish, or if you just fancy a coffee while you soak up the view above, there’s a new rooftop seating area in the cafe right next to Ladies View. If you’re driving the Ring of Kerry via the ‘official’ route, you should finish up in Killarney. Personally, I prefer Kenmare, but choose whichever suits your needs. Chill here for the night and toast a pint to what’s been an unforgettable Irish road trip. I’ve done some research online and found that the below providers are the best rated. Naturally enough, take some time to research them yourself in advance of parting with your hard earned cash. ‘Just as Killarney itself has a long established reputation as one of the World’s tourism centres, Deros Coach Tours has long provided tourists with a totally authentic Kerry experience for most of that history. Deros is a family business that was founded in Killarney town centre in the middle of the last century. In 1949 Denis and Eileen O’Sullivan started running tours from Killarney with a single vehicle. ‘O’Connor Autotourswas established in 1945 to cater for the transport requirements of overseas visitors to Ireland and in particular the South West of Ireland. It was as i was driving down the road in the photo above (captured via a mounted GoPro – never record and drive) that i first appreciated why people the world over travel to Ireland to cycle the Ring of Kerry. The route takes cyclists along quiet country roads (where possible) and passes through all the main towns and villages along the way. The entire journey is roughly 216km long with 74km of the route on the main road and 143km of the route on minor roads. Here’s a map to follow as you’re planning out your trip. How long you allocate to do this cycle is entirely up to you. If I was fit enough and cycling was my thing, I’d be opting to do it over 4 or 5 days, and squeezing in a handful of hikes and walks along the way. Every year the Ring of Kerry Charity Cycle, a non-profit organisation of everyday people who come together every year to make a powerful difference to the lives of thousands of people in need across our local communities, takes place. It been going on for over 36 years and nearly €16 million for around 160 charity organisations has been raise over the years. The Ring of Kerry Cycle (which you can register for here) is always on the first Saturday in July. It takes over 1,200 volunteers and just one part-time employee to make the Ring of Kerry cycle possible. One part-time employee… madness when you consider what’s achieved. I’ve scoured the web to find the most frequently asked questions that you might have. If there’s something that I’ve missed, just post a comment at the end of this page and I’ll get back to you ASAP. How long does it take to drive the Ring of Kerry? So, you could (emphasis on could) drive it in a day. Even with the added alternative route in our guide above, but it’d be a manic day and you wouldn’t really get to appreciate everything there is to see and do. If you’re stuck for time, fair enough, do what you’ve got to do, but I’d recommend a minimum of two days if you fancy heading off on walks and hikes. You should drive anti-clockwise round the Ring to avoid meeting tour buses (of which there are MANY) head on at narrow stretches (of which there are also many). Officially, it starts and ends in Killarney. If you follow our guide, you’ll start in Killarney and finish in Kenmare. As you’ll see from our guide to planning a trip to Ireland, I leave the comments section open on all guides and respond to each and every comment. If you have a question about driving the ring of Kerry, let me know in the comments below. Use Pinterest? If you could give the below a pin, I’ll owe you a virtual pint!